We’re just a couple weeks away from Passover, one of Judaism’s most important holidays, which tells of our exodus from slavery in Egypt to freedom as a united people living under Jewish law. December 25 for DC Jews! It’s that time of year again, when many of our compatriots are nestled under a fireplace with stockings and a big pine tree. 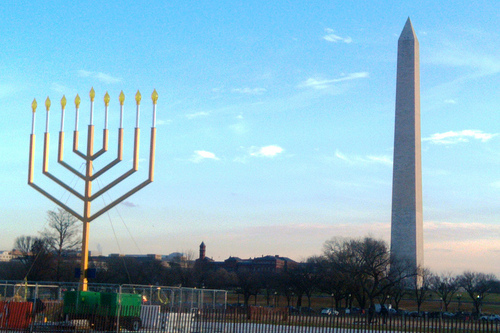 But how can a Jew in DC spend Christmas? By eating Chinese food? (Actually, you can! ) Check out those, and other events below. Join over 1,000 volunteers in making Christmas a little bit brighter for those in need. Sign up for various projects, from delivering meals to wrapping gifts, and even donating blood. Come spread the holiday cheer. Now at two locations, this hot dance party features various different types of dancing from hip hop to international, top 40 to retro, and a special ident has you hopping from one party to the other. One of the biggest nights of the season; thousands of people expected to celebrate! Indulge in the classic Jewish Christmas feast with fellow young professionals. Then head to the movies—this year, you have a choice between “Little Fockers” and “True Grit”! Optional after-party to follow. Another Passover-themed event, join over 1,000 people at this split 20s/30s and 35-plus party to drink, socialize and give to charity, like the Susan B. Komen Breast Cancer Foundation! You can also win door prizes and drop off food for people in need. Read last year’s entry here. Note: This blog will be on hiatus for the next week, as I will be visiting family. Hope everyone celebrating has happy holidays! Adat Shalom: Is 2011 a Year of Decision for the Middle East?